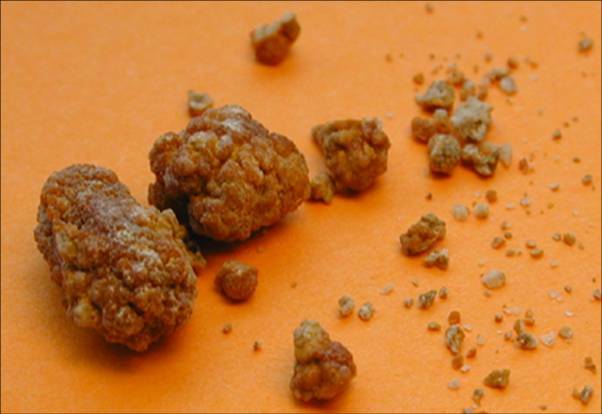 Kidney stones are hardened formations in the kidneys or urinary tract, resulting from the accumulation of existing crystals in the urine. His presence may go unnoticed without symptoms, but can also cause severe pain that starts in the back and radiates to the abdomen to the groin. It’s a pain that manifests itself in colic, that is, with a peak followed by pain relief. In general, these attacks may be accompanied by nausea and vomiting and require medical, hospital. * Obstruction of the urinary tract. In addition to clinical evidence (signs of pain and blood in urine), kidney stones can be diagnosed by abdominal X-ray, ultrasound or by excretory urography, a more specific examination of the urinary tract. Medications can be given only by the physician taking into account the cause of stone formation. During the crisis, it is indicated the use of painkillers and potent anti-inflammatory drugs to relieve pain, which is extremely strong, almost unbearable. * Lithotripsy, ie bombardment of stones by shock waves aimed at fragmentation of the calculation which makes their elimination in the urine easier. * Percutaneous or endoscopic surgery: through the endoscope and through small holes, the calculation of the kidneys can be removed after fragmentation. * Ureteroscopy: endoscopic, allows you to take the calculations located in the ureter. * Do not automedique or make their own diagnosis. Get medical attention, especially if you have severe pain back or abdomen and signs of blood in the urine.